Hi, guys! 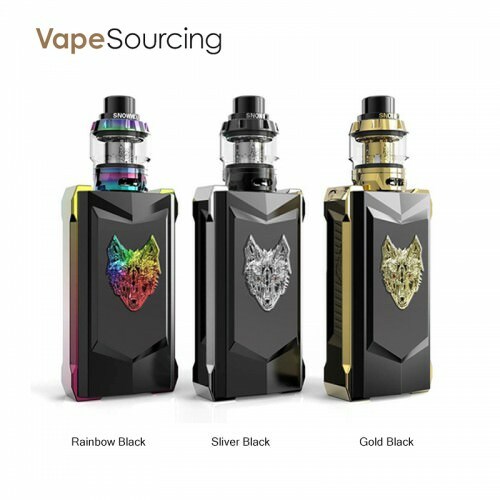 When you see the Snowwolf Mfeng Kit Limited Edition 200W at the first sight, you will fall in love with it because of its cool appearance, which looks high-class and luxurious. Now let see more details about Snowwolf Mfeng TC Starter Kit below. Snowwolf Mfeng Kit Limited Edition is designed into a masculine style with the ferocious wolf on the surface, it consists of 200W Snowwolf Mfeng MOD and Mfeng Sub ohm tank. Powered by dual 18650 batteries with a brand new chipset, it supports the output range of 10-200W and will prove its high-performance. Equipped with an intuitive 0.96 inch TFT Full-Color screen and human-friendly interface, Mfeng kit also supports VW/Bypass/TC(Ni/Ti/SS/TCR) modes to meet your vaping needs. 3 colors for you to choose. There are three colors for you to choose, so you can have a choice for your favorite color one. Now the Snowwolf Mfeng TC Starter Kit are sold on Vapesourcing at the competitive price. It’s a good device to have a try.